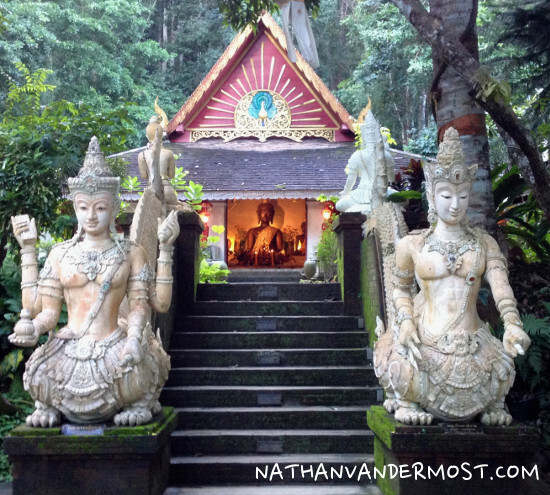 When I first arrived to Chiang Mai and walked off the plane, I looked across the tarmac and saw the base of Doi Suthep (“Doi” in Thai means mountain). 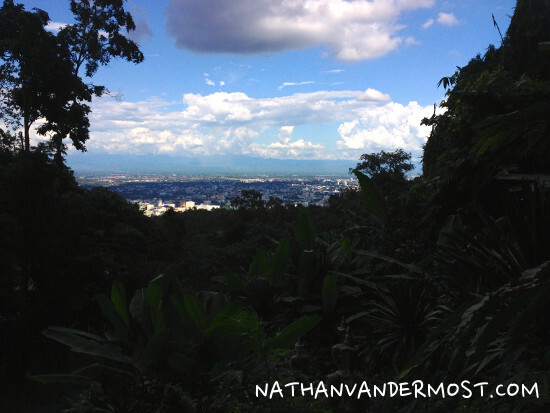 It is a large mountain that overlooks Chiang Mai from the west. I really enjoy playing in the mountains and enjoy being able to look at Doi Suthep any day while I have been living in Chiang Mai, Thailand. 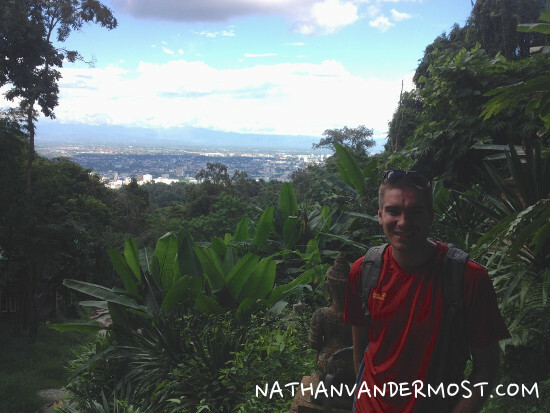 I wondered if hiking Doi Suthep was possible? 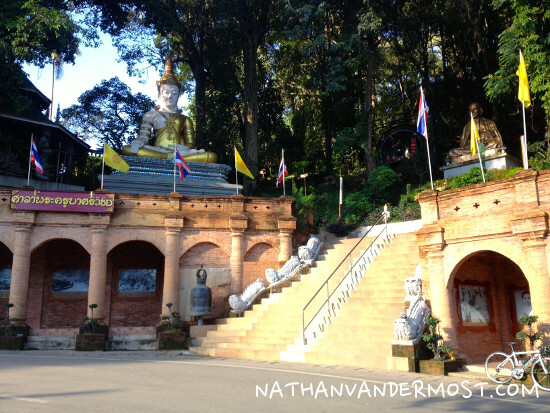 The first few weeks while in Chiang Mai, I joined some other travelers and we took a songthaew (taxi) to the top of Doi Suthep where Wat Phra That Doi Suthep lies. 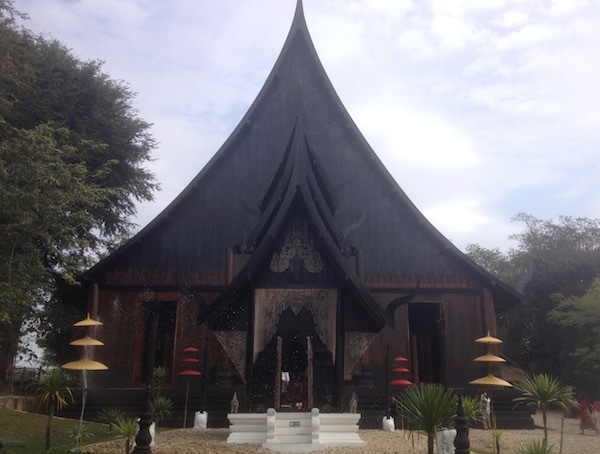 It is a beautiful temple that overlooks the city below and is worth visiting. 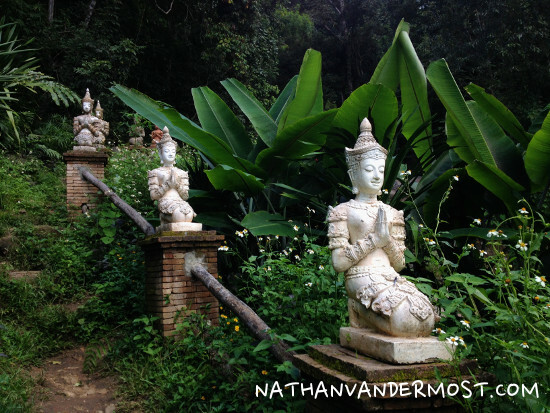 Now it has been 6 months since I have been in Chiang Mai and I finally had the opportunity to go hike Doi Suthep! A colleague and friend of mine, Will invited me to go hiking on a Sunday afternoon. 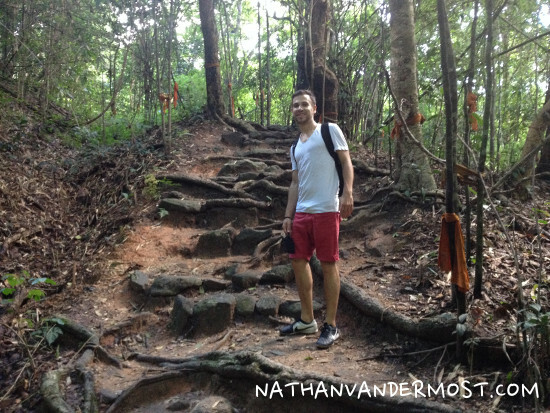 It was really hot and humid but I had been wanting to hike Doi Suthep since I arrived to Chiang Mai. Will had done some research on how to find the trailhead for the hike but it is not easy to find. 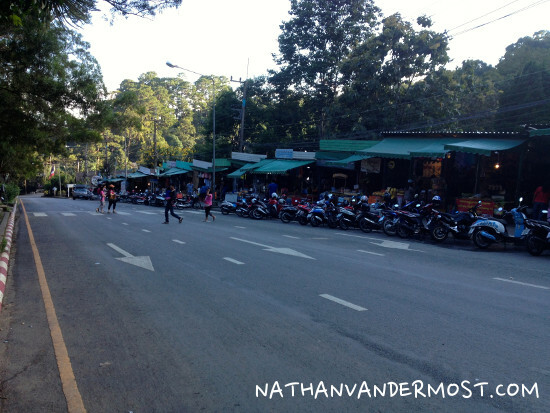 You start by driving west on Suthep road towards Doi Suthep. At the end of the road you make a right which takes you behind the Chiang Mai University campus. Following, you make a left on a road that climbs abruptly. You drive on it for 5-10 minutes and the trailhead is on your left. When we arrived, there were no other vehicles that were parked in the parking lot. The trailhead has a sign with a map of the trail which indicated that we were at the right place. Will and I started hiking and the trail started to climb from the start. The trail is well marked and there is green foliage that lines the trail. Beware as there are many spider webs that cross the trail and they are not that pleasant when they get into your face. 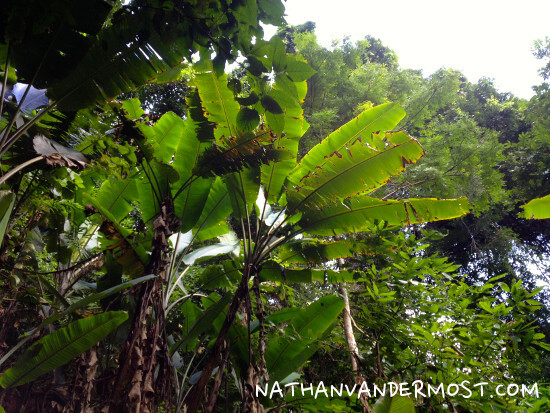 It was a really hot day but it was cooler while hiking in the jungle with the vast foliage coverage. 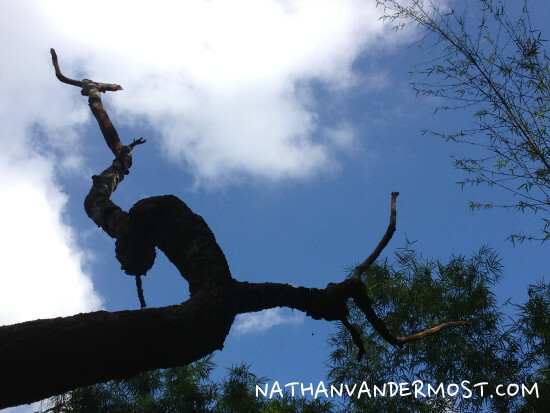 There were some really interesting trees, birds, and insects that we passed. After walking for 45 minutes and about 2 miles, we arrived to to a temple that is only accessible by foot. There is a river that runs next to the temple which makes for a very picturesque experience. 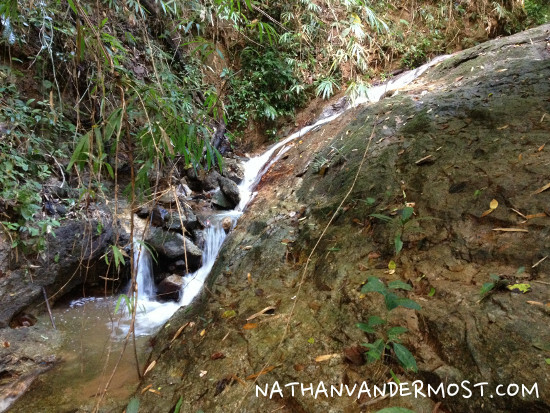 The river flows over smooth limestone into the jungle below with a view of Chiang Mai in the background. 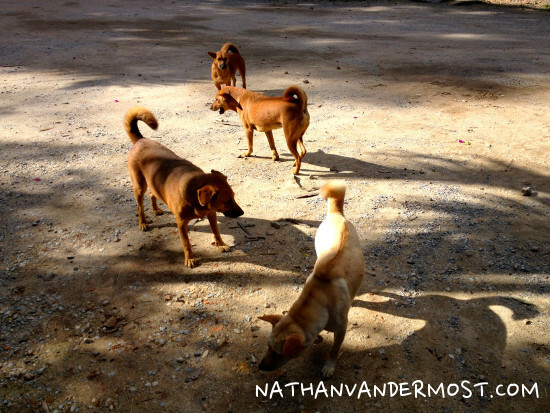 Will and I were also welcomed by a group of dogs that live at the temple. Stray dogs and cats are a common sight in Thailand but dogs and cats can find sanctuary at temples as monks will feed them. After looking around the temple and taking some photos, Will and I kept hiking. 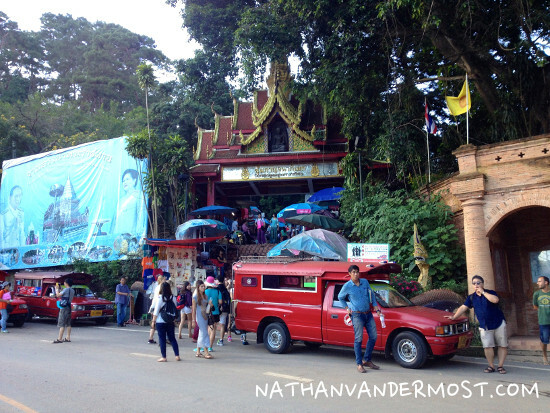 After another quarter to half-mile, we came to the road that goes to the temple at the top of Doi Suthep called, “Wat Phra That Doi Suthep.” At this point you have to walk up the road for about half a mile and the trail continues across the street. Fortunately, this road is the only road that I have felt safe as a pedestrian in Thailand. The road is also a popular hill climb for local cyclists and runners. It is a two lane road in both directions and has a shoulder. After walking up the road, we were in search for the trail. Will and I had never hiked on the trail before and we did not know what we were looking for. We noticed a big white sign that was blank and there was an established trail that went beside it, so I assumed that was the trail we were looking for. The trail climbed abruptly and was very steep. There were clay steps formed by a lot of trail use. Will and I left the trailhead at 3:30pm and it was roughly 5:15pm by the time that we had reached where we were. I did not want to get caught in the dark and thought it would be prudent to stop at a certain time if we did not reach the top soon. 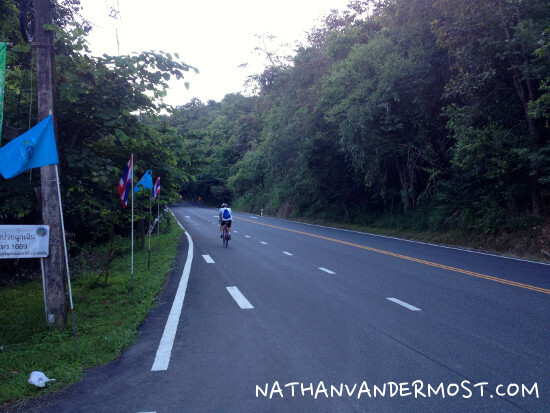 After pushing a little further, we hit the main road again and the sun was blaring in our eyes as it was starting to set behind Doi Suthep. At this point, there is a partially paved road that goes to the right but we decided to walk along the main road instead. 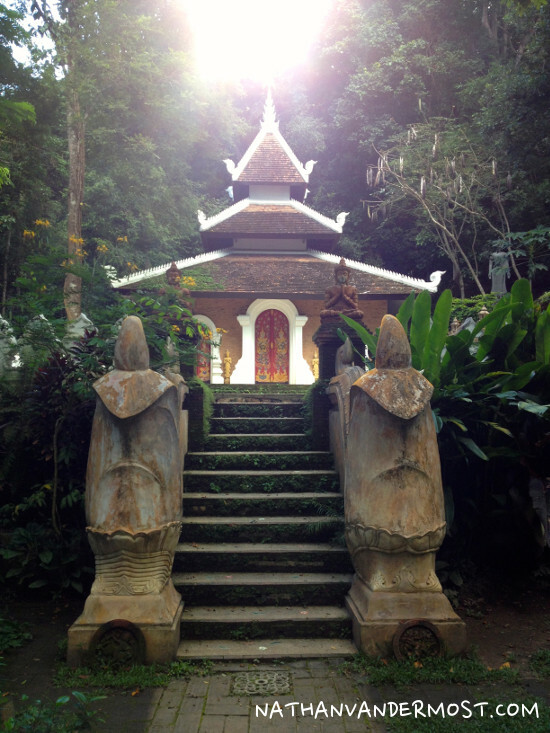 After another 15 minutes of walking, we had made it to Wat Phra That Doi Suthep, the temple at the top of the road. Whew! Once you reach the top, at the base of the temple, there is a long line-up of food stalls that have a variety of traditional Thai cuisine. Will and I were pretty hungry and thirsty when we got to the top and I devoured some coconut water and a banana honey waffle! We reached the top at about 6:00pm and it gets dark around 7:00pm. We still had to make it back down the trailhead to our motorbikes. 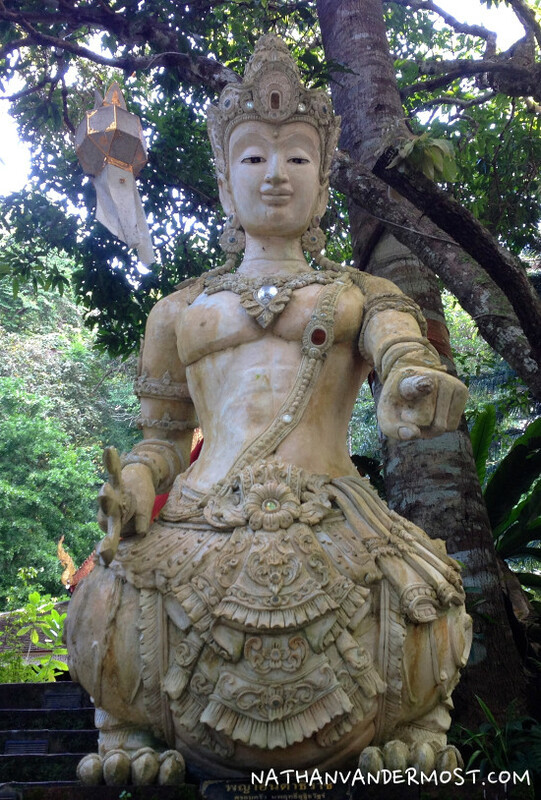 The temple is a popular tourist destination and therefore, there are a lot of Songthaews (taxis) that are available. 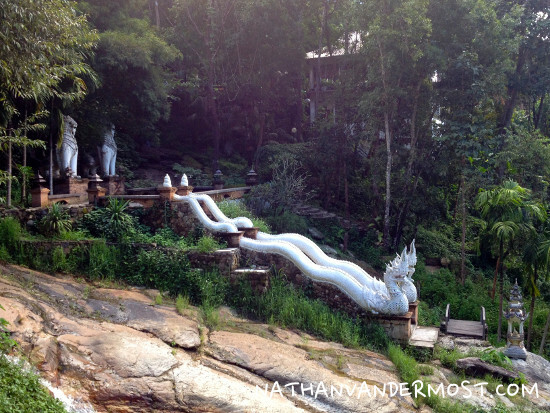 Will and I decided to take a Songthaew down the mountain, close to the first temple that we encountered during the day. This would cut-down on the necessary walking time needed to get back. We were able to find one very quickly and boarded the truck. I felt bad for the other passengers as I was soaked in sweat… While we were seated in the bed of the pick-up truck Songthaew, we were attentive to our surroundings and making sure we stopped at the right place. Fortunately, I recognized the big white sign that was next to the trail when we ascended. There is a red button that rings a bell in the driver cabin to alert him or her that there is a passenger or passengers that would like to depart the Songthaew. While the Songthaew was quickly descending Doi Suthep, Will and I pressed the red button and we came to an abrupt stop. I am sure the driver was slightly confused as to why we were not going all the way back into the city. Will and I got back on the trail and passed back through the lower temple and safely descended back to the parking lot. It was an awesome day for a hike and I will be coming back to do it again! I would recommend it to anyone, even if you only go to the 1st temple. Be sure to bring a lot of water! 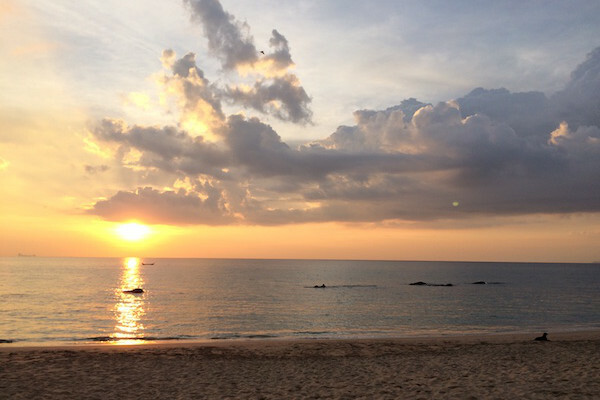 previous post: Elephant Island: Waterfalls, Beaches, and Seafood, Oh My!